There are currently 48 recognized breeds (by ARBA)! 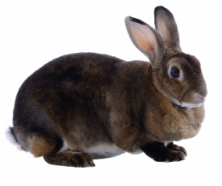 While some breeds are known to be more friendly than others, it all depends on the rabbit being handled and cuddled from a young age so they become used to human hands, smells, and the positions that you hold them. 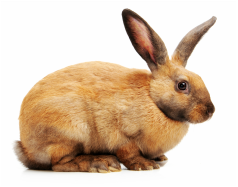 Any rabbit can become skittish when they are afraid, no matter what breed. Female rabbits are also bigger than males, simply because they are built to give birth. This rabbit has a "sweet" temperament and the does have great mothering abilities. Not many people own this breed, it's considered "rare". 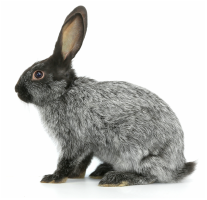 This rabbit breed has a soft coat that people love! They're docile and, unfortunately, used for pelts. Because of this, they are considered rare since they keep being "used". This breed is playful and active! They love attention and need to be brushed anyway so it works out great! This friendly and docile rabbit has shaded points which makes it... well... adorable! One of only a few breeds to stand in an arch and be judged while running. These active rabbits need a longer & larger cage for exercise. Not many people own this breed, it's considered "rare". This breed is smart, clean, and well tempered. 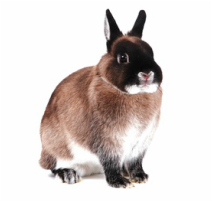 They are commonly used for pelts and considered a rare breed because they are not common as pets or show rabbits. The larger of the "eyeliner" breeds. This hardy breed is docile but active. They are also occasionally used for meat but considered rare since not a lot of breeders have them. This is one of the smallest breeds. They're active and require handling to teach them how to stay put & pose for showing. These rabbits can be super cuddly pets! They're the fat version of the himalayan! 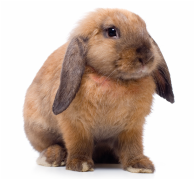 This breed is also used for meat, so be sure to buy a young rabbit that you can handle to ensure friendliness. (Many meat breeds are ignored to avoid attachment). This breed is larger and can be used for meat pen. They're not common in the USA but beloved for their color and disposition in Europe. A large, active rabbit! As the third biggest, you need a big set of hands to handle this rabbit. It has a great set of markings though! This rabbit is laid back and makes a great pet! 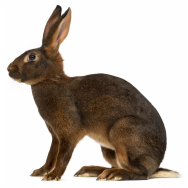 They can be used for meat or pelts, but are more commonly seen as show rabbits or pets. This creamy rabbit is a beautiful color and can be a great cuddle! They have a silver gene which causes their coat to lighten and slowly become lighter as they age. Known to have very sweet personalities but some of the hardest markings to achieve and one of the most competitive for showing. Highly recommended as family pet! This breed has a white coat and black "eyeliner" markings. It's quite popular but has strict rules in judging based in size and body type. Intense hair care routine but friendly personalities. They are the only Angora with hair on their ears besides the Giant Angora. Known for their SUPER long ears, these animals want to relax, be curious, and be chill. Tip to tip, their ears can measure 21-32" long! Known for being the LARGEST rabbits. Some are larger than small dogs. Despite their size, they're very friendly and love to cuddle! Don't be put off by their red eyes! This angora may require the least grooming out of the angoras because of the bigger undercoat. The still need to be groomed regularly and should have special care to keep cool in the summer. These are the biggest of the lop variety but are kind and gentle. 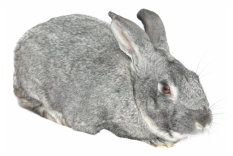 This large rabbit is special because it is the only ARBA breed that has awn wool. It has a large body type and even larger fur that requires lots of grooming! This breed started as the smaller American Chinchilla but then the US wanted bigger rabbits for more meat and fur. Thus, the Giant Chinchilla! 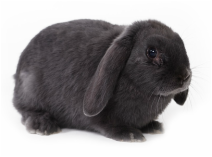 This unique rabbit is alternately striped with black and another color. 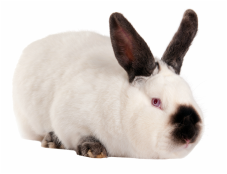 They're playful, intelligent, and great pets & show rabbits, though markings may be hard to perfect. Known for their LONG bodies, these friendly rabbits know how to stretch out! The smallest of the lop type. Fun to cuddle, hard to breed. Plus, floppy ears! This breed is very popular is shows and also as a pet. They're very docile but require regular grooming for their long hair. Fuzzy head- shorter haired body. These small cuties are the most recently added breed! They're intelligent and very friendly. A very, very popular breed in shows- not recommended for a beginner who wants to win shows. They come in many colors and love to cuddle. The smaller version of the Rex. It's very short and soft fur makes it a popular choice, but without proper handling when young, this breed can be feisty. Known for the sheen on their fur! As the smallest breed, these cuties are both hard to breed and can have a bad attitude! Not great for children unless you get it young and handle it a lot to make it friendly. Unfortunately, this breed is raised for Meat Pen (to eat). Don't let this stop you from saving one! They tend to be larger and "meaty". Be sure to buy a young rabbit that you can handle to ensure friendliness. (Many meat breeds are ignored to avoid attachment). These rabbits make great mothers and have a good temperament. They're often overlooked for lack of fancy markings and are on the "rare" list. These guys are small and shiny! They're active but also have a calm personality. It's very short and soft fur makes it a popular choice, but without proper handling when young, this breed can be feisty! This rabbit has a shiny coat with a silky texture! These are solid rabbits that are very popular in shows! These curious and active rabbits are one of the only rabbits that has ticked white hairs and white-tipped hairs throughout their color, making them look like they were covered in tinsel! This breed only comes in black coloring with white ticking that makes it sparkle silver! They're docile and relaxed. 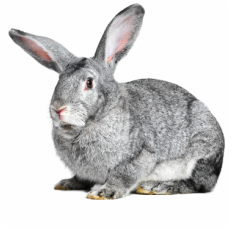 with soft, "polished" fur, these playful yet timid rabbits me great pets and show animals! Their underside has a light color with some ticking into the lower coloring. Beloved for their soft chinchilla-like fur, these compact rabbits are great for pets and shows, especially cuddles! This breed has a full arch with sticking color of deep red on the chest and underside. They are active and need a large cage. They're curious and fun loving animals!